The OP of the answer in question has repeatedly succeeded in getting comments deleted that contradict the claims made in the answer. In my view, the comments were matter-of-fact and provided a carefully crafted, easily verifiable rebuttal. After back and forth involving a moderator, after my comment had been deleted repeatedly and I had reposted it, initially genuinely believing this was a mistake, it was agreed that my original comment should stand, and that the only comments that should remain were the moderator's and two of mine (my original comment and an ancillary one that contained a command to verify my reasoning, but since to me the issue was so obvious, I decided to remove it later to reduce noise). The OP was advised that the only way to have the remaining comments removed was to fix their answer. Instead of fixing the answer, the OP eventually updated their answer to argue that their solution is correct, after all. That argument was based on an (unsourced) quote from my own answer. Given that the answer now contained another - in my estimation - falsehood, and the quote from my answer was taken somewhat out of context, I felt it appropriate to address that issue too. A new comment was posted, which, as before, I believe to be matter-of-fact and to contain a concise rebuttal; it also provided a link to the source of the quote. I believe that it is important to let critical comments stand, assuming that they are (still) relevant and not ad-hominem. The linked answer has many up-votes (presumably, because it seems to work, because the unwanted side effect it has easily goes unnoticed), so it is important to let future readers know how and why the answer is flawed. I find it troubling that my comments were repeatedly deleted for the sole reason that the OP tried to squash dissent and made enough noise to get their wish repeatedly. Other than taking my case here, which is obviously only suitable as a one-time approach, how should such cases be handled? Is the need to allow moderators to delete comments without fuss simply the price to pay for such - hopefully only occasional - missteps? Comments are just a part of the system we have to deal with Questions and Answers. Comments are ephemeral. All comments are subject to deletion at any time for any reason. Ideally, correct and currently apropos criticisms should not be deleted, but it happens. Make your comment a clear and concise criticism. Think twitter, but shorter. The problem with this answer is it says <X> but the [documentation](http://docslink) says <Y>. If you, genuinely, and in good faith, think a moderator was fooled by an incorrect flag into deleting your comment, address that in a follow-on comment. Still getting deleted, but you're sure you're right? Don't keep reposting the same comment - that doesn't make you look good. Bring it to meta's attention. I was hoping you would, and you did, thank you. We live in the real world, so our ideals are met with contingencies. Answerers write a correct answer in the first place. If answerers write an incorrect answer, they fix their answer on your first comment, and then correctly flag it as obsolete. If they don't fix it, your critical comment stands to warn readers until they do. If your comment gets inadvertently deleted, someone else's comment works just as well (or better). If bad stuff stands uncriticized, you take it to meta, and I hope we resolve it here once and for all. It takes time for the community to deal with bad stuff. This is not a one-time thing. This will happen again. You brought it to meta, which is fine, and if it happens on another Q&A, I hope you say something again. You can also bring it up in chat. I do worry that we didn't have others also address the answer as well over time. But I also think that bringing it to meta was the right thing. We want to elevate the Questions and Answers. Comments are quite useful, but when their usefulness is outlived, they get in the way, and need to be deleted. Anyone with power to delete them will make mistakes sometimes (and I'm not saying any particular deletion in this case was wrong per-se). That's why we have elected community moderators to handle these issues and respond on meta when there are questions about it. Not the answer you're looking for? Browse other questions tagged discussion moderation deleted-comments . Is it appropriate to invite scrutiny of a highly up-voted, disputed answer? How/Why were my comments deleted? 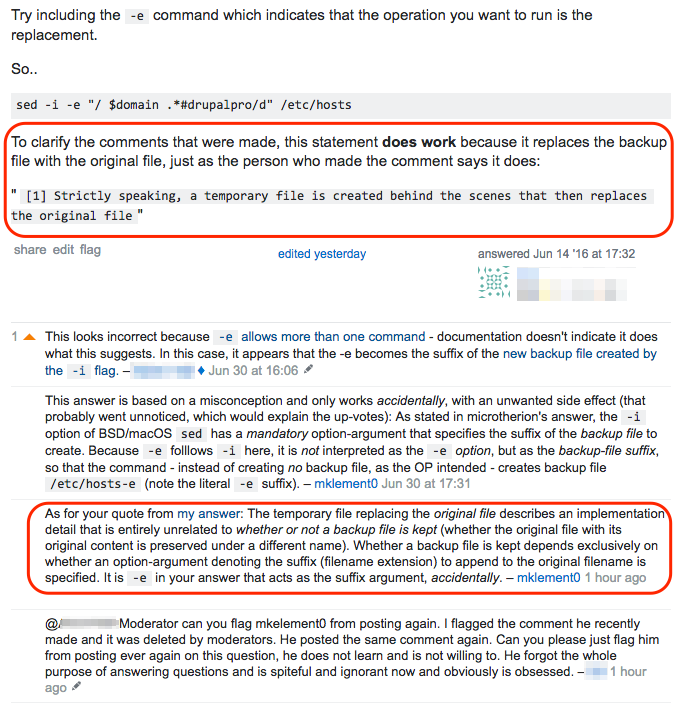 Is there a way I can find back my comments deleted by others on Stackoverflow.com? Do I have a superpower? What happens to log history of comments done on a deleted post? Is pointing out OP's accept ratio in comments inappropriate?